The fundamental conviction underlying the series is that when the Bible is faithfully taught, God's voice is clearly heard. Few commentaries are written specifically with the preacher or Bible teacher in mind, and with the sermon or Bible talk as the point of reference. The preacher, the sermon or talk, and the listener are the 'key' drivers in this series. 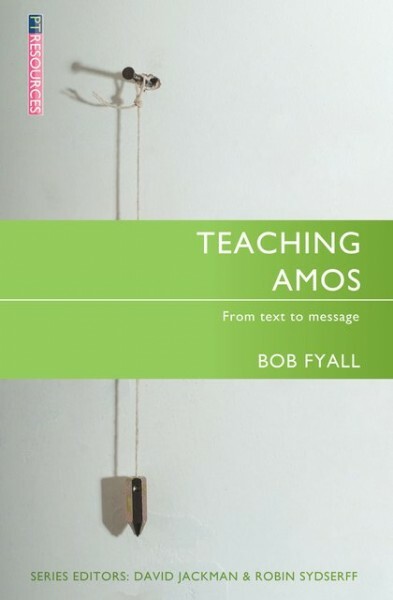 'Teaching Amos' is written by Dr Bob Fyall, who has a particular passion for preaching and teaching the Old Testament. He is author of a number of books, including the Focus on the Bible volume on Daniel. Having first outlined a number of possible approaches to constructing a series of sermons or talks on Amos, Bob unlocks the text based on a suggested structure of nine sermons or talks. Individual chapters are specifically geared towards working from text to sermon, combining rigorous exposition with relevant application, always with an eye to the main teaching point of the passage. This volume will not only encourage better preaching on Amos, but serve as a timely reminder of the striking relevance of the prophet's message for today. Bob Fyall is Senior Tutor in Ministry for the Cornhill Training Course (Scotland). Prior to that he was the Director of Rutherford House, Edinburgh. He is an experienced pastor, preacher and Old Testament scholar.